Eco-Friendly Products that contribute our efforts to make this planet a green and healthy place to live! The Best Bamboo is a direct exporter for bamboo products throughout the world. Whatever the product, project, or idea, we can supply your needs with competitively priced American bamboo materials! **We don't buy or sell products made in China** as we believe in the potential of the American Bamboo Culture and we are specialized in the largest and strongest bamboo species of the Americas: Guadua Angustifolia. 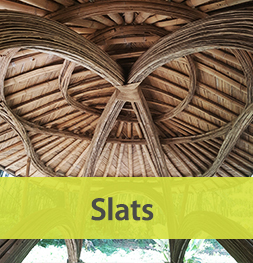 Commonly known as Guadua or Guadua Bamboo, this remarkable construction material is used in an array of mainstream applications in Colombia. Not only does this bamboo species have the desirable characteristics of long length, wide diameter, and durability, Guadua is extremely renewable, has a high level of CO2 sequestration and a rapid rate of biomass production. In 1999, a 6.2 earthquake resulted in the Colombian code standardizing of Guadua as seismic-resistant, due to the many Guadua-constructed buildings that withstood little to no damage! As owner of its own plantations in Valle del Cauca, Colombia, all our bamboo poles, pressed panels, bamboo seedlings, and other bamboo related products are mainly produced at our facilities were our bamboo is sustainably planted, harvested, treated & dried, to ensure top quality & competitive prices in the market. We are very proud to state that only the best quality materials will leave our facilities to reach all our international customers. The Best Bamboo ™ products are all CVC certified which gives our customers the environmental awareness of the bamboo origin, the sustainability practices and most important the approval for its commercial harvest. 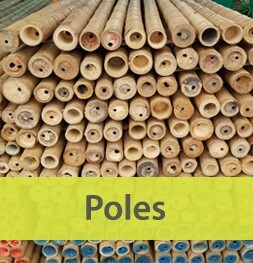 The Best Bamboo is proud to deliver the best bamboo poles for sale available at the best prices as we are manage and control all the chain of production from the seedling to our distributors around the world. "Need help with a quick bamboo quote? - CLICK HERE!" The Best Bamboo offers a variety of premium bamboo poles for sale that have been harvested in a socially responsible manner. We specialize in the best bamboo pole species: Guadua angustifolia, which can be used for heavy duty construction projects, bridges, art installations, fences, gazebos, tiki bars, furniture, cladding, ceiling covers, and this list goes on... All our bamboo poles for sale are sustainably harvested from mature stems and treated to last for at least 30 years (if used correctly). Crafted from the highest quality Guadua Angustifolia available in Colombia, our bamboo slats are made by split opening the best bamboo pole into rectangular strips. This strips allow great flexibility and resistance, and as you can see in some of our images, by joining several bamboo slats together you can obtain very resistant structural beams used in construction all over the world! 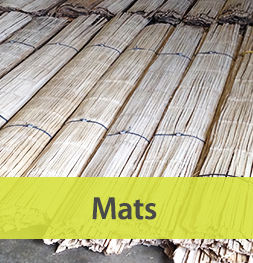 Bamboo Mats or Crushed Panels are basically flattened bamboo poles. They are a very common source for bamboo fiber used in the modern industry for several purposes. For example bamboo fiber for sheets and towels have become mainstream products popular with consumers looking for green products with high performance qualities. The Best Bamboo is excited to introduce our new Solid Bamboo Timber. At the moment we are producing laminated bamboo boards as a sustainable solution for the architectural and building industries.